Chart showing number of permits issued in Arizona per year from 1950 through 2011. 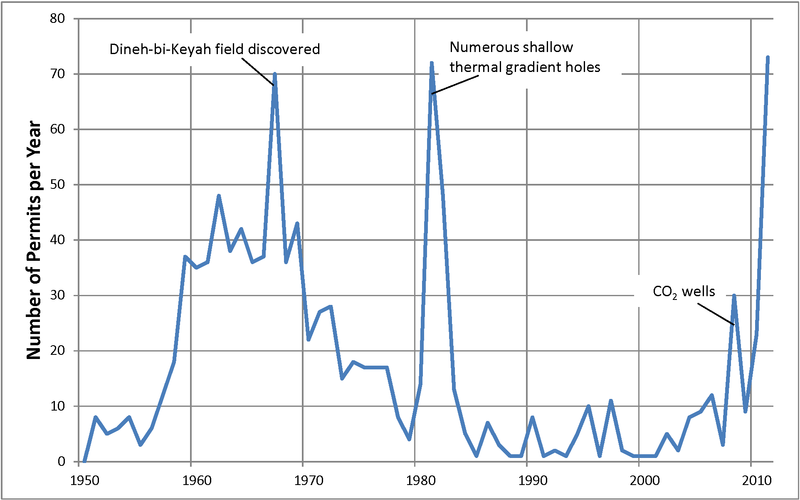 Seventy five drilling permits were issued, which set a record for the number of permits issued in a single year (see graph), 67 wells were drilled, and two wells were plugged in 2011. All but two permits and all wells drilled were stratigraphic tests for potash east of Holbrook. The two non-potash related permits were for obligation wells at the St Johns Gas Unit. The two plugged wells included an abandoned well drilled in 1968 at the Dineh-bi-Keyah oil field in northeastern Arizona and a stratigraphic well drilled in the Picacho Basin by El Paso Natural Gas in 2006. The AZGS is evaluating several geologic formations in northeastern Arizona as part of the Rocky Mountain Carbon Capture and Sequestration (RMCCS) team. The primary focus of the RMCCS team is to drill a stratigraphic well to characterize rock formations in and around the town of Craig, Colorado for their potential as future carbon dioxide storage options. 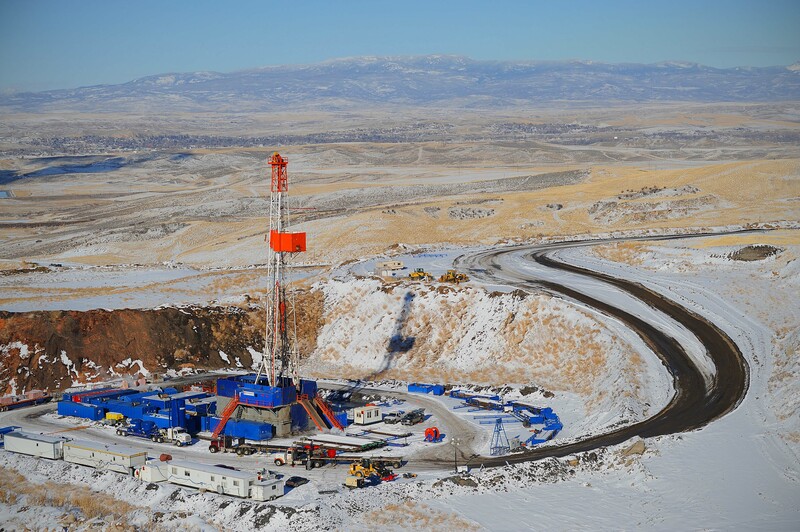 Drilling progress and daily activity of the RMCCS State #1 well is available at http://rmccs.org/updates.html. Southwest Exploration/Passport Potash drilled 31 wells at its potash project west, southwest, and east of Petrified Forest National Park near Holbrook. Passport released a NI 43-101 technical report on the exploration potential of its land holdings in early November. HNZ Potash drilled 24 stratigraphic wells southwest and east of Petrified Forest National Park. HNZ has completed its drilling program in October and is preparing a NI 43-101 with the data. American West Potash drilled 12 wells at it potash project east of Petrified Forest National Park. American West completed its drilling program in September and released a NI 43-101 technical report in October. A permit is required from the Oil and Gas Conservation Commission for the potash stratigraphic wells because the holes penetrate the Coconino sandstone, a potential helium reservoir in the area of the Petrified Forest National Park. The Little Colorado River Plateau Resource Conservation and Development Area, Inc. developed a potash information website to provide information about potash mining and the Holbrook Basin. See the new website at http://www.holbrookbasin.org/index.html. There were 511,000 acres leased for oil and gas in Arizona at yearend 2011, down from the 710,000 acres at yearend 2010. Oil and gas leases on State Trust land totaled 479,000 acres in December 2011, up from 352,000 acres in December 2010. Federal land leased in December 2011 totaled 32,000 acres, down from 358,000 acres in December 2010. Oil production totaled 36,925 barrels from 9 producing wells in 2011, down from 40,137 barrels from 14 wells in 2010. Gas production totaled 168 million cubic feet from 5 producing gas wells, down from 183 million cubic feet from 5 wells in 2010. No CO2 was produced in 2011. There were two active disposal wells and 24 shut-in wells at yearend including 20 oil, 2 gas, 1 CO2, and 1 disposal well. One disposal well was plugged in 2011. The Oil and Gas Conservation Commission held three regular meetings and one hearing to consider a spacing request in 2011. The Commission granted an application by Ridgeway Arizona Oil Corporation to drill and produce carbon dioxide and helium gas wells on 160-acre spacing units in its St Johns Gas Unit in Apache County. Current commission members include J. Dale Nations, Tucson, Chairman; Stephen R. Cooper, Casa Grande; Frank Thorwald, Show Low; Robert L. Wagner, Mesa; and Maria Baier, ex-officio member and State Land Commissioner. Links to rules and statutes and other information about oil and gas in Arizona including online well data and logs may be found at the Commission’s web page at www.azogcc.az.gov.